The manner in which we experience pain is sometimes regarded as a defining feature of being a human. The very fact that we are able to react to negative external stimuli is something which suggests our sentience. Pain does, however, serve a very important biological function: it is a warning. Pain warns us that the body is in danger and prompts us to react by withdrawing from whatever is providing the negative stimulus. In this manner, pain is a survival tactic vital to all living beings; it’s that sensation which attempts to keep the body safe. There are, however, many individuals who experience pain differently – from those whose neural-receptors don’t register any painful sensations at all, to those who suffer from chronic pain, there are many cases which demonstrate that the manner in which the mind and pain interact are vastly complicated. As such, the function of pain is to force an individual to withdraw from anything which has the potential to injure or damage. While this sensation should be temporary, the last few decades have seen a substantial rise in cases where the pain simply does not abate. Because of this, the medical industry has been forced to find accurate definitions for what classifies as “chronic” pain. While all of this can be incredibly daunting – there are, after all, so many possible causes for chronic pain- don’t despair just yet. Pain is still a product of the mind, something produced by nociceptors and their reactions to stimuli which can sometimes remain active despite the stimulus no longer being present. Mental anaesthesia: In the same way your doctor might provide you with an injection for the pain, try imagining a syringe filled with a local anaesthetic injecting the area and this making the pain dissipate. Switching focus: As your pain perception is particularly heightened, try and distract from the painful area by focussing on a point of your body which does not hurt and imagine that area heating up. You could also try lightly pinching somewhere which doesn’t hurt, as this will force your brain to respond to stimuli from that area of the body. Transferring sensations: Similar to distracting yourself, changing the way your body experiences the pain has been known to diminish its effect. If your pain is hot and burning, try picture it turning into ice and vice versa. The blank spot: Pick a spot on a wall and focus all of your pain and frustrations on that blank area. Do your best to visualise the pain moving from your body, out into the air, and finally being absorbed into the wall. Yoga or meditation: Yoga has always been an important exercise for chronic pain sufferers, and it’s not just for stretching out those muscles. By taking the time to focus on your breathing, your mind becomes much more aware of your body, your pain receptors take a back seat, and ultimately, your body has a chance to refresh itself. A newer alternative form of pain management therapy is biofeedback. 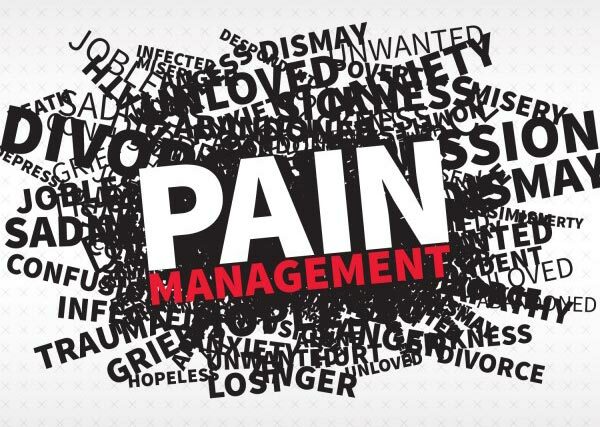 Although the groundwork for this form of treatment began in the 1950s, it has only been in the last 15 years or so that the treatment has begun to be used relatively widely for pain management. Biofeedback is a process which is meant to allow the patient to gain a greater awareness of certain physiological functionings of their own body, and in doing so, learn how to exercise a greater degree of control over them. During such a treatment, the physician will attach several sensors on various bodily areas, before connecting them to a device which monitors bodily functions, including your breathing, perspiration, temperature, blood pressure, and heartbeat. You are then expected to relax, clear all thoughts from your mind, and begin breathing deeply. Once you being to slow down your breathing, you’ll also begin to slow down your heart rate. By observing the fluctuations in the numbers on the monitor, you should be able to distinguish between how your body regulates conscious and unconscious bodily processes, and ultimately this leads to you being able to have a greater degree of control over your own body. A little bit like the breathing techniques learnt in yoga, the purpose of biofeedback is to train you to minimise your body’s natural “fight or flight response” to stressful situations. The goal is for you to learn the art of relaxing your breathing and as many of your muscle groups as possible. Finding a complete state of relaxation should enable your control the pain and stiffness felt from excessive muscle contractions. While this technique has many critics, the basic principles are similar to many forms of alternative therapies which have all had substantial results in curing chronic pain – ultimately, you’re using the power of your own brain to calm the nerve impulses. This really is mind over matter. Brain controlling body pain.